On November 26, ten of us got together in Trier to taste 18 Mosel Riesling Kabinett wines from the highly touted 2015 vintage. My idea was to keep the list short and to focus primarily on the top sites and best-known estates of residually sweet "classic" Kabinett, such as Joh. Jos. Prüm, Forstmeister Geltz Zilliken, and Maximin Grünhaus—all three members of the Grosser Ring – VDP Mosel-Saar-Ruwer. Back in June, at the BerlinKabinettCup 2016, the host of this annual tasting event, Martin Zwick, had 43 different Kabinetts for us to taste at his apartment in Berlin’s Charlottenburg district. I felt this was too many wines to judge at one sitting. He had 2015 Riesling Kabinett wines from the Mosel, Nahe, Rheingau, and Pfalz. Despite many wines, the tasting was well organized. Martin has done a lot to bring more attention to Kabinett in Germany and beyond. For our tasting in Trier, I wanted us to have fewer wines and to discuss what we blind-tasted after each flight without seeking a winner at the end. Before we began the tasting, we also chose not to score the wines, whether using the popular 100-point scale or another scoring system. The VDP only wants the Prädikat designations for unchaptalized sweet wines now. The idea was to create a taste profile for each Prädikat, instead of having a dry or near-dry version of Kabinett, Spätlese, or Auslese, which was still confusing to consumers of German Riesling, especially in export markets. Some argue that so-called classic Kabinett, Spätlese, and Auslese wines always had a certain degree of leftover sugar, but it’s more complicated than that. According to the VDP, legally dry (trocken) or medium-dry (halbtrocken) Rieslings—including the top-end dry wines, called Grosses Gewächs (GG)—can be chaptalized, therefore they have no Prädikat. The VDP is copying the Burgundian model for these wines, with a focus on GGs. Some members justify this classification by saying that this was the traditional way German wines were labeled around 1900. Back then, the best Mosel wines were mostly dry and labeled after their locality, whether a village or site name but were unchaptalized. Auslesen were mostly made from botrytized grapes and tasted riper and sweeter. There were no Mosel Rieslings labeled as Kabinett or Spätlese during this period. In any event, many nonmembers are following the VDP classification model. Florian Lauer of Weingut Peter Lauer once told me that today’s Mosel Kabinetts should contain between 18 and 60 grams of sugar per liter for VDP members (which, by the way, is a wide range for creating a taste profile). This was the latest information I had, before Klaus Peter Keller of Weingut Keller wrote me that a Kabinett from a VDP.Grosse Lage should be no more than 85 degrees Oechsle, have less than 10 percent alcohol and at least 20 grams of residual sugar per liter. This is different from what Michael Schmidt reported on May 4, 2016. The critic David Schildnecht thinks Schmidt, who writes for Jancis Robinson’s website, is correct. The VDP actually requires a minimum of 85 degrees Oechsle for all wines from a VDP-designated grand cru, including Kabinetts from the Mosel, Nahe, and Rheinhessen. No one seems to know what the latest VDP rules are, as they are constantly changing. In the December issue of Wine & Spirits Magazine, David Schildknecht wrote an article titled "Klassical Revival," which looks at growers who are reviving the Kabinett category—in particular, those growers, like Julian Haart, who seek to make the so-called classic fruity Kabinett wines at lower must weights and with lower amounts of residual sugar, à la Joh. Jos. Prüm. His approach is to increase the yields in blocks with very old vines. Julian Haart, who had stints at a number of top producers (Heymann-Löwenstein, Emrich-Schönleber, and Egon Müller), also apprenticed at Keller. He is good friends with Klaus Peter Keller, "KP" for short, and the two look to the old "Kabis" from Maximin Grünhaus as one of their benchmarks. Egon Müller, it should be noted, has mostly one cane and very low yields for all his wines, including the Scharzhofberger Kabinetts. At the winery where I work, the Webers also believe in one cane per vine and produce light-bodied wines. The former longtime cellarmaster and vineyard manager at Maximin Grünhaus, Alfons Heinrich, made both dry and sweet Kabinett wines. The first vintage of Kabinett trocken at Grünhaus was 1979. The so-called classic fruity Kabinetts, first labeled as "Kabinett" in 1971, rarely topped 25 grams per liter (see the second part of my two-part article titled "Unlocking the Kabinett" for more on this). The must weights were, on average, lower back then. The ripeness levels are higher now because of climate change, lower yields, and greater selectivity in picking. Heinrich fermented most of the wines in either 1,000-liter Fuder or 10-hl pressure tanks. Today, the style has evolved under Stefan Kraml, who took over the vineyard and cellar work from Heinrich in 2004. A friend who is a wine critic and with long experience in German Riesling feels that the dry Grünhäuser wines don’t have the same kind of "clarity, refreshment, and detail" of those from the eighties and nineties. If this is true, it might be due to more phenolics from cluster-zone leaf removal (see comment) and pre-fermentative maceration (skin contact), though these methods are quite common among the best winemakers of dry German Riesling. (This kind of reminds me of Müller-Catoir, with the transition from the legendary cellarmaster Hans-Günter Schwarz to the Moselaner Martin Franzen. Both Kraml and Franzen are shy and talented but had big shoes to fill.) Some fans of Grünhaus feel that the estate shouldn’t be producing dry Riesling, much less Spätburgunder. But I’ve had some outstanding dry Grünhaus wines from the 1980s and ’90s. The owner of Maximin Grünhaus, Carl von Schubert, says that the vineyard management is better than before. In the cellar, they replaced many of the old worn-out oak Fuder casks with stainless-steel tanks and discontinued using the large pressurized ones, though there has been a movement back to Fuder—namely, customized casks made from Grünhaus oak. Carl says that Fuder and 1,000-liter to 2,000-liter stainless-steel tanks are ideal for fermenting the Rieslings from Grünhaus. If it was up to him, he would just have Fuder, but it entails more work. David Schildknecht and other wine critics wrote that there was a dip in quality at Maximin Grünhaus beginning with the 1998 vintage until about 2004. (Now it seems that the venerable Karthäuserhof estate, across the Ruwer Valley from Grünhaus, is in a slump.) Grünhaus is better known internationally for its sweet wines, including the cask-numbered Auslesen, and no longer labels its dry wines with a Prädikat. This already occurred before the estate rejoined the VDP. Carl von Schubert—whose eldest son, Maximin, is being groomed to succeed him—changed Spätlese trocken to Alte Reben trocken in 2008. As the new chairman of the VDP, his estate now bottles Grosse Gewächse instead. He uses, like most Mosel VDP members today, the extra-tall bottles for his GGs. The high-end, near-dry Superior line, such as the excellent 2012 Abtsberg Superior, has been in these taller 350-mm bottles as well (see "Flutes and Labels" for the latest on this topic). Certain people, including growers, claim that yields need to be higher, as at J.J. Prüm, to produce delicate off-dry and sweet wines—in particular, Kabinett. But Grünhaus is said to have had low-average yields (30 ha/hl) in the nineties as well. Egon Müller, as stated earlier, also restricts yields and retains wonderfully light, balanced residually sweet wines. These are the big three in the Mosel wine region in terms of reputation. In the late 19th century, Egon Müller and Grünhaus (then only 11 hectares) were renowned estates, which had an average production of about 36 and 38 Fuder, respectively. It should be noted, too, that Grünhaus has had rows of wire trellises on Grünhäuserberg since the early 1900s. Egon Müller has converted most of his plots on the Scharzhofberg to wire, except for the core single stake-trained old vines in "Dem breiten Weinberg," where guests are typically taken on a short tour of the vineyards. Müller would have to take out every second row to make this large block on the steeper part of the slope more efficient to work. The key, however, is the old, own-rooted vines, not necessarily the single-stake training, or Einzelpfahl in German. His vines in this prime sector of the hillside have one short cane instead of two large canes shaped like a heart. (He has other old-vine parcels, like higher up "In Pergentsknopp," trained on wires.) The higher-density plantings on wooden stakes meant more yield and made more sense when there was no shortage of cheap labor, as the system requires much more work. Though it is easier to move around the vines. It had less to do with bringing better-quality grapes. On the contrary, wider spacing between the rows provides more sunlight for photosynthesis and air movement to help fight against fungi, and the wire-trellis system allows for more leaves per grape bunch. Many vineyards, especially on steep slopes, still have vines trained on Moselpfahl. As he did for the BerlinKabinettCup 2016, Felix Eschenauer of Medienagenten arranged the flights for the tasting. I had invited him to join us, but he and his wife, who live in Bad Dürkheim, in the Pfalz, just had their second child. So that’s when I asked him to do the order and pairings for our get-together. We also invited Klaus Peter Keller and Konstantin Weiser, but they already had other plans. The tasters: Stefan Schwickerath (host), Lars Carlberg, Yong Truong, Marius Fries, Per Linder, Jean-Philippe Frot, Jörg Jakobs, Johannes Weber, Manfred Heinz, and Carsten Haase. Stefan offered a couple more wines for the tasting. I gave in and added one pairing at the last minute, which bumped the total from 16 up to 18 bottles. Marius put this last-minute flight in the middle of the tasting. Marius arrived a little earlier to prepare the flights: he removed the capsules, uncorked the bottles, and covered them with aluminum foil to hide the labels. I chose bottles with only natural corks and avoided those producers that package their Kabinetts in the extra-tall bottles. This made it easier for eliminating candidates and tasting the wines blind. Fortunately, none of the wines had cork taint. Before the tasting, we stood around the kitchen and tasted a couple of bottles of champagne: Pierre Péters’s L’Esprit de 2008 Blanc de Blancs Grand Cru and Marie Noelle Ledru’s 2008 Grand Cru Brut Nature. It was a good start to the evening. These were followed by a bottle of Hofgut Falkenstein’s 2015 Niedermenniger Herrenberg Kabinett trocken AP 1, which is a favorite of mine—one that reflects my notion of the essence of Mosel wine. It’s an understated wine, with a dry, lean, and salty taste. For me, it’s a pure expression of place, which, with residually sweet Kabinetts, becomes more difficult to discern. Marius called it a bit closed and restrained but mouthwatering. The Webers avoid tactics such as vigorous de-leafing and cold-soaking, both of which increase the phenolic content of the wine. I also wanted to show that Kabinett, as a Prädikat—in the sense of light-bodied and no chaptalization—shouldn’t be restricted to wines at 20-plus grams of sugar per liter. The wines below this cut-off point are what made the Mosel famous at the turn of the 20th century and are ideal at the table. After we sat down at the long table for the tasting, Marius fetched the bottles for each flight and passed them around. We all had two Zalto Universal glasses, which Manni brought to the event. The first pairing was an immediate contrast in styles. Manni wondered why these two wines were paired together. In comparison, the Keller Kabinett, the lone outlier, seemed noticeably sweeter, despite having a similar level of residual sugar and acidity as the Egon Müller. Johannes and others really liked this wine, especially its intensity and clarity. No one recognized it as Rheinhessen, though. Niersteiner Hipping is a site on the famous Roter Hang, or red slope, a relatively steep red-colored slope with a weathered clayey red slate soil, also Rotliegend, on the Rhine Front. Nierstein is located just upriver from Mainz. Stefan and Marius thought it tasted more like a Spätlese. Marius found it very charming and open. Jean-Philippe was bothered by the SO2. The pH of the 2015 Hipping was surely higher than the 2015 Scharzhofberger, which was rather stinky, flinty, and lemony. Some of us thought the Scharzhofberger was fermented in stainless steel. I liked it. The wine wasn’t showy either. Marius appreciated its restraint and salinity. But Müller’s wines usually don’t have a sponti stink. This surprised a number of the tasters after the wines were unveiled. Müller is not dogmatic about spontaneous fermentation. His cellarmaster, Stefan Fobian, also uses certain neutral cultured yeasts for fermenting different Fuder casks. It just depends on the vintage and wine. In an article titled "Große Lage" in Die Zeit by Heike Faller, Fobian is quoted as saying that the 2015 vintage was the first one in which he was truly hands-off—meaning, most likely, no additions for fining, de-acidifying, or yeasting. Both wines have about 40 grams of residual sugar. The Hipping was fermented in stainless steel, though some thought wood. KP, who loves Mosel Kabinett, says that there was not enough for a Fuder. It has 81 degrees Oechsle, 9.8 grams of acidity per liter, and 41 grams of sugar per liter. This wine comes from 60 percent on the steep slope of Hipping, the auction wine from 80 percent. The Scharzhofberger Kabinett Alte Reben AP 3 is designated as coming from "old vines" and was fermented in Fuder. Müller sells this bottling only to restaurants. The auction wine with the same name is AP 4 and sold for 160 euros per bottle, before taxes. On his visit to the Scharzhof to taste the 2015 collection, David said that both were excellent but distinct. Marius found the AP 4 even more profound at the Grosser Ring auction. Felix paired Hipping and Scharzhofberger together because he felt that each wine is rather different from the rest, plus the lower residual sugar. For the second flight, the 2015 Brauneberger Juffer Kabinett from Max Ferd. Richter tasted very good. It has 45.4 grams of sugar, combined with 9.8 g/l acidity. The upbringing in Fuder rounds the acidity. I thought it might be the 2015 Maximiner Grünhäuser Abtsberg, as I had this wine once before and it tasted a little sweet. Some felt the same way, while others liked its complexity. 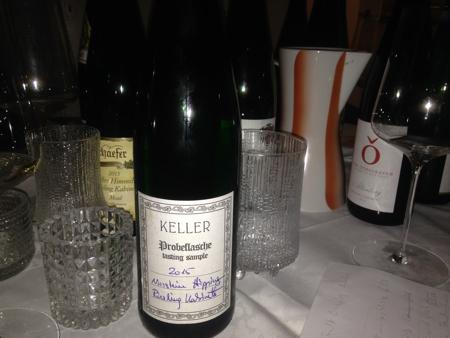 The Euchariusberger Kabinett AP 8 was floral, tangy, and fresh. It had more nervosité between fruit and mineral (Saar) acidity than the Juffer. Manni found the Falkenstein more complex. This comes from a core plot of old, ungrafted vines in the best section of Euchariusberg. Marius indicated that it was one of his favorites and resembled the Scharzhofberger with its restraint and salinity. Felix felt that these two wines are very close in style and taste more herb, or dry, than some of the other wines. That’s why he put them in this flight. The 2015 Wehlener Sonnenuhr Kabinett from Max Ferd. Richter had a marked sponti nose and was more golden than the J.J. Prüm, which typically has a pale color. One taster found the Richter a little plump, another felt it showed plenty of slate aromas on the nose. It was open. Johannes really liked this wine. Constantin Richter wrote that the grapes come from a 1.5-hectare block in Wehlener Sonnenuhr and is a blend of several Fuder casks. It was also the winner at the BerlinKabinettCup. One taster felt that the J.J. Prüm tasted a little dropsig, or candied. This connotation often refers to certain cultured yeasts. But I re-tasted it at a dinner party last night. It was a true Kabi and didn’t seem as if it were made with added yeasts. Sadly, none of us identified the wine at the tasting as Prüm. We were pretty blind. Felix noted that these two classic Wehlener Sonnenuhr producers, which have decidedly different styles, are more similar in the 2015 vintage. He felt the wines are, as usual, marked by the lees, though less so than in other vintages. Willi Schaefer’s 2015 Graacher Himmelreich Kabinett had a more gold-colored tint and a berry-toned flavor. It has changed quite a bit over the last several months. In contrast, J.J. Prüm’s 2015 Graacher Himmelreich was pale, light, and crisp. It had a bit of a stink, which is typical of young Prüm wines (see "What’s the Stink?" for more on this). One taster felt that the Willi Schaefer was marked by botrytis and the J.J. Prüm tasted more like a Spätlese. The Schaefers fermented this particular wine in Fuder. J.J. Prüm has stainless-steel vats, though no one is allowed in their cellar. The estate, for whatever reason, also prefers not to have the amount of residual sugar or other stats publicized. Felix wanted to show two very different styles from one famous site. The 2015 Wolfer Goldgrube Kabinett from Vollenweider was sponti and lively. This fermented in a stainless-steel tank. We liked it more than the 2015 Ellergrub Kabinett from Weiser-Künstler, which, unfortunately, didn't show too well at the tasting. The wine was raised in Fuder. One person found it slightly bitter and wondered about the grapes. But I know that Alexandra Künstler and Konstantin Weiser are very selective during the harvest. We even opened a second bottle. I have to believe that this wine, like the 2015 Schaefer Himmelreich, was in a bad spot. Both have shown much better on other occasions and are two of my favorites. In terms of style, Vollenweider’s 2015 Kabinett is elegant but riper and sweeter than, say, J.J. Prüm, which remains a benchmark for light-bodied, filigree Kabinetts, though the wines can lack a little concentration in certain vintages—for example, the 2011s. The 2015 Goldgrube has 57 g/l RS and 10.5 g/l acidity, the 2015 Ellergrub 58 g/l RS and 11 g/l acidity. For Felix, the theme was a comparison of two distinct sites in this lesser-known part of the Middle Mosel. The von Othergraven 2015 Altenberg Kabinett was sponti and tasted delicate. Andreas Barth fermented this light-bodied Saar Riesling in stainless steel. The 2015 Schloss Lieser Juffer Kabinett, also vinified in steel, was crisp and very fine. It was among the favorites at the tasting. Marius thought it had more Spätlese character. It seemed less artisanal and edgy than some of the other wines to him. Both estates are known for having young wines with a noticeable stink from reduction and spontaneous fermentation. This was the flight that we added on the day of the tasting. Felix didn’t know about these bottles. I really liked the 2015 Graacher Domprobst Kabinett from Willi Schaefer, and so did the others. Usually, the Schaefer Himmelreich is the more brisk and light wine of the two. One taster found it quite pure. It had good tension between fruit and acidity. In comparison, the von Hövel Scharzhofberg Kabinett, which has 57 grams of sugar, was a little disappointing. It didn’t taste as fine as the Schaefer, which was raised in Fuder. I’m not sure if von Hövel’s 2015 Scharzhofberg Kabinett was in wood, stainless steel, or fiberglass. Felix indicated that these represent the more rustic, old-style wines, thus the pairing. Felix wrote that both wines in this flight are very fine, with a similar piquancy—hence the pairing. The Zilliken wines were excellent, but they were fairly ripe and sweet for Kabinett. Marius said that they tasted more like a Spätlese—or even an Auslese. He says that it wasn’t just the high level of residual sugar but also the detail and depth of the wines at such a low alcohol. The Bockstein has 64 grams of sugar, while the Rausch has a whopping 69.4. The acidity for both is lower at 8.6 g/l. The Rausch tasted a little better. As with all the wines from Zilliken, these were raised in oak Fuder. For each wine, the Zillikens make a blend among the different casks in January, and the wines are bottled in April. Felix put this flight at the end because of the higher sweetness levels. In fact, he ordered the flights by increasing amounts of residual sugar. He also thought that the last flight would be a good comparison—two different sites from the same estate. There’s no question that a number of top producers were left out of the lineup, such as A.J. Adam, Haart (formerly labeled Reinhold Haart), Julian Haart, Nik Weis – St. Urbans-Hof, Peter Lauer, Wwe. Dr. H. Thanisch – Erben Thanisch, Dr. Hermann, Fritz Haag, Selbach-Oster, Ansgar Clüsserath, and Jos. Christoffel jr., among others. I heard that A.J. Adam, one of the most talented growers in the region, made some low-Oechsle Kabinetts in the 2015 vintage. But my selections included six of the top-ten 2015 Riesling Kabinetts from Gault&Millau Weinguide Deutschland 2017, which voted Hans-Joachim Zilliken as "winegrower of the year." The guide's top four Kabinetts included—in this order—Zilliken Rausch, von Othegraven Altenberg, Falkenstein Euchariusberg AP 8, and Keller Hipping (auction bottling). Egon Müller's two auction old-vine Kabinetts—AP 3 and 4—were not ranked. Gault&Millau only tasted and rated these at the Scharzhof. (Egon Müller also has a regular Scharzhofberger Kabinett AP 2.) The other wines from our tasting that made the top ten were Zilliken Bockstein, Weiser-Künstler Ellergrub, and Keller Hipping. During the tasting, it became clear that the pairings played an important role in our perception of the wines. We were comparing the two wines more to each other than to the wines in the other flights. And it was difficult to pinpoint where the wines came from, which made it humbling. Yong told me that we should have had a bottle of plonk in the mix, just to see how it would have shown with the other wines. In retrospect, we could have been more disciplined by sampling each flight in silence, before commenting on the wines right off the bat. At the BerlinKabinettCup 2016, it was quiet during the flights. This helps to concentrate on the wines without being influenced by the opinions of others, but we wanted to enjoy ourselves. Marius said that the wines were way too young, but it was fun to taste through the lineup. In his opinion, there are at least two different groups: pure, fruity, clean wines that are often vinified in stainless steel and showing well now; and the understated wines often raised in big, old wood casks. Lars, comparing this tasting to the one in Berlin, how do you think the few extra months in bottle changed the wines ? Did they perform similar ? Beyond scoring, are there any wines you particularly liked or disliked ? Marius, I can’t give you an answer. There were just too many wines in Berlin. It’s hard to say. Two of my favorites, Willi Schaefer’s 2015 Graacher Himmelreich Kabinett and Weiser-Künstler’s 2015 Enkircher Ellergrub Kabinett, didn’t impress me at the tasting. But I’ve really liked the wines on other occasions. 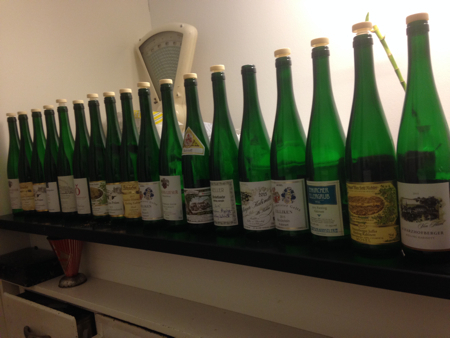 Thank you, Lars, for the nice write-up about what must have been a remarkable tasting. I’m envious! I have noticed from the picture that the Egon Mueller wine has a normal cork, rather that the screwcaps on the Kabinett and Spaetlese which I have received. What’s the policy of this producer concerning the closures? That’s a good question. Egon Müller uses both natural cork and screw cap. His merchants or importers decide on which closure they prefer. If they choose screw cap, then it has to be for all the wines, including the higher predicates. Thanks! This is a weird policy, I must say… Is there a price difference between the closures for the importers? I don’t think there’s a price difference. Hey Lars – GREAT write-up packed with information. Clarity is a word I keep coming back to over and over when trying to describe 2015. As for Kabinetts it has become my favorite category along with Feinherbs, as long as they are on the lighter side and have acidity. Thanks for the great article. Look forward to seeing you at Rieslingfeier! You’re welcome, Robert. I look forward to seeing you at Rieslingfeier, too. Last night, Yong invited Konstantin Weiser and Alexandra Künstler to dinner at his home. Marius and his wife, Eva, joined us. Konstantin says that the 2015 Enkircher Ellergrub Kabinett is right now in an odd place. He describes the aroma as diffuse, with a bit of a Böckser, or sulphide off-flavor. He hopes that it clears up. I’m confident that it will be fine. He says that the 2011 Ellergrub Kabinett went through a similar phase. Instead of drinking only Mosel Riesling, Marius brought from his cellar fino sherry, champagne (Cédric Bouchard, Aubry), and Chianti (Pian del Ciampolo). Alexandra and Konstantin had a bottle of champagne (Tarlant) as well. It seems the 2015 Schaefer Domprobst Kabinett showed lighter than the 2015 Himmelreich Kabinett at your tasting? If so, I hope the 2015 Himmelreich Kabinett lightens up again! Yes, Willi Schaefer’s 2015 Domprobst Kabinett seemed lighter than their 2015 Himmelreich Kabinett at our tasting. In December, I had a chance to talk with Christoph Schaefer about it, as we were both invited to a party at Cantzheim. He’s confident that the 2015 Himmelreich Kabinett will be fine. While it’s true that the VDP only applies the Prädikat designations to residually sweet wines for its new classification, there are still nonmembers who choose to label their dry and off-dry wines with a Prädikat, which indicates an unchaptalized wine. That’s one reason why Koehler-Ruprecht left the VDP. Karthäuserhof’s first GG was from the 2009 vintage. It formerly labeled its “best” (ripest) dry Riesling as Auslese trocken “S.” Under Christoph Tyrell’s administration, the estate became well known for its fresh, crisp, clean, dry Rieslings made by the former cellarmaster Ludwig Breiling. Most of the 19-ha Eitelsbacher Karthäuserhofberg is first-rate. But a change in ownership, in 2012, has been difficult. The new owner made some much-needed renovations but also chose to switch teams after a couple of years. The former winemaker and later manager at Karthäuserhof, Christian Vogt, who started in 2008, is now making the wines at Selbach-Oster. Tobias Busch, who later assisted Christian in the cellar, is at St. Urbans-Hof. The last I heard was that Johannes Rumpf (Kruger-Rumpf) was in charge of managing the estate but has moved on after one year. Karthäuserhof’s 2016 harvest is said to be very small due to peronospora. In my article, my point was excessive cluster-zone leaf removal, which, even if done early (around bloom) to lessen berry compactness and to help fight against rot, still exposes the clusters to direct sunlight. The Riesling grapes grow thicker skins and the ensuing wines have less acidity (freshness) and more phenols. The issue of hedging is different from removing leaves in the cluster zone. If you hedge too early—which many less quality-conscious growers like to do to increase yields—it can lead to more botrytis down the road. Some growers prefer to remove leaves, if at all, on the morning-sun or east-facing side of the canopy in rows running north-south. This improves air circulation and spraying of fungicides without the intense exposure of the afternoon sun.